K.I.S.S. 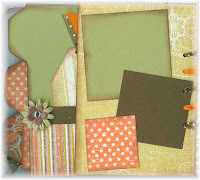 Crop-n-Shop Scrapbook Events: It's Friday already! Whew, where did this week go? Geez, the weeks almost gone again!! I've been working like a crazy lady yet don't seem to have accomplished much! Hope you had a great week! This weekend I'll be scrapping with a great group of ladies at our April Scrappin' U. I do have two seats left if you are interested in spending a fun day of scrapping for only $12.00. Contact me by email at info@kisscropnshop.com if you want to join us Saturday, the 26th. This is the new acrylic album kit I've designed using MOSD Cover to Cover Album. It was so much fun to make. It's hard to tell in the pictures but it has an acrylic front and back cover (front cover shown peeking into first page of album) with chipboard tab pages on the inside. It's even got some fun little half pages inside as shown below. 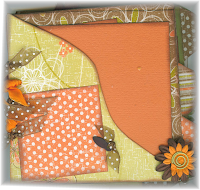 Very fun to make and looks great with your pictures in it! It's on sale at all Creating Keepsakes show as well as at http://www.licketysplitscrapbooks.com. As with all my kits, your papers are pre-cut for you, includes photos and instructions, all embellishments and ribbons needed to complete the project. Even the album is included! !